We will be using stems from the tune “Headrush” by Secret Recipe. You can download them for free below. Please tear them up, chop em up, glitch them out or whatever you want to do. You don’t have to make a full remix, just use something from the stems in general. Don’t worry about making a tune like this one. Do you and make your own music. Don’t limit yourself to a genre or try to appeal to anyone. Have fun, stretch yourself, try something new, and just make music 🙂 Check out the full details below on how to participate. Download the free stems below. Stems provided by Secret Recipe off of his tune “Headrush” on Gravitas Recordings. Use something from the stems no matter how little. You can include any other sounds you want from your personal library. Create a 1-2min song. 140 bpm. C minor. Please submit a mastered tune (self-mastered is completely fine). Deadline to enter is June 30th, 2018 @11:59pm (your time zone). The finished file name should be “Artist Name – Production Challenge #”. If you want your tune shared on the Create SoundCloud page please leave it on public. This is totally optional. 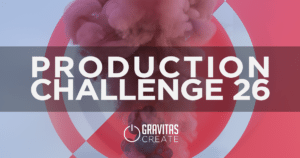 Go celebrate and feel free to share your entry on the most current promo/feedback thread in the Gravitas Create Community Facebook Group. SECRET RECIPE IS CURRENTLY ON TOUR! CHECK OUT HIS SCHEDULE BELOW. Secret Recipe, formerly known as Intellitard, is a resident and founder of Oakland’s ever-popular Wormhole Wednesdays and head of the ever-growing Wormhole Music Group label. Secret Recipe blends together a unique medley of sounds that weave together cosmic, sparkling melodies and squelchy, deep whomps all marked by signature breaks and heavy experimental sound design. He has toured vast portions of the U.S. and has played a variety of noteworthy festivals such as Infrasound, Enchanted Forest, The Untz Festival, Stilldream, Fractal Beach, Emissions, Treefort, Pirate Party, Konnexion, Raindance, Lucidity, and many more.